Maxstor’s metal Container and stillages are safe and convenient storage solution system for any manufacturing business. This corrugated steel box has great potential of holding a wide variety of products. Metal Bins and stillages have a sides to hold and resist the goods inside from damage, like a box. This makes bin pallets an ideal storage system for bulky or unusually shaped items which helps in transportation conveniently. Metal container and stillages are manufactured from sheet steel and reinforced it due to which can carry heavy loads. It has welded construction due to which they are more robust, rigid, long lasting and cost effective solution. 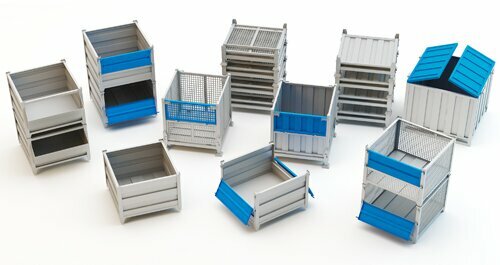 Mesh container and mesh stillages makes easy of storage for difficult objects. They offer extensive flexibility, if it has to be used in conjunction with the accurate handling systems. Mesh container and mesh stillages allow for flexible positioning and easy access in the workspace. Mesh container and mesh stillages are suitable for use in a widely in all types of manufacturing industries for the storage of a wide range of products and materials. Customized dimension can be made to meet the demands of your products and business requirement. We offer a design service for such goods that require modification or re-engineering. Collapsible mesh container and mesh stillages are designed for workspace and storage efficiency. Once the goods have been delivered, the collapsible unit can be reduced and close, stacked one upon another which results in space saving. This reduces the transport costs and increase productivity as well as profit. Mesh container and mesh stillages are constantly stacked once used and mesh sides creates protection of the goods in transportation. The robust, durable and rigid structure allows to hold a variety of objects with different shape & size and when they are not in use, they can be collapsed and stacked constantly, saving on logistics costs.